First match and wondering about which gun to shoot and some other things. Here you go. The file will be removed in a couple of days. You can generally shoot the .22 throught the 3 aggs at most matches. Most use the .22 score for your classification and the other 2 aggs are just for practice. With the new 2700 .22 Grand, match directors can submit all 3 if you like and they are set up for it. Yes, shooting only a .22 is very OK! As a matter of fact it is encouraged to help shooters improve. Gun, ammo, a good attitude and a willingness to learn are the minimum. Spotting scope, pen and stapler are next. After that you can see all the junk everyone else has in their boxes and start your own collection. However, at most matches you can show up with nothing and people will loan you enough stuff to get started. Good Luck and welcome to BULLSEYE! First six matches, focus on learning the match routine, and learning how to score, and be safe. I would not shoot the revolver. Too much to worry about, and hard to reload quickly. Just shoot the .22, and try and shoot next to someone who will help you learn how a match runs. Don't go to the match just to go "bang!" Shoot your .22 (and concentrate on every shot). If the club allows it, as ours does, shoot the 2700 with your .22. The match experience is much more important than just shooting an "acceptable" caliber. Welcome to your new lifetime pursuit, and stay in touch with the Bullseye-List. Thanks for all the advice guys!!! You I will take your advice on the .22. I have a good 22, with enough ammo for the match. Might as well start up with a known setup that I know will shoot much higher scores then I can. I guess I will sign up for the .22 Caliber 2700 Aggregate match. I have not read much about them. Im guessing its just like a normal 3 gun 2700 match, but shooting all .22.
s1120 wrote: Im guessing its just like a normal 3 gun 2700 match, but shooting all .22. Yup -- 270 rounds of .22 (so bring at least 300 rounds, in case of alibis/jams). I was planning on 400 just to be safe. If you ever decide to shoot your revolver in the 2700 match, there is a way to keep up reloading. Since you have a K frame Smith, buy 2 or 4 Safariland speedloaders and the tray that holds the ammo for the speedloaders. You can load just 5 rather than six and they will still work. Have the tray loaded before the match starts. During slow fire, load loose rounds, you will have plenty of time. Then switch to using the tray to quickly fill the speedloader. There are enough places to hold enough ammo to do the timed and rapid fire with two spots left over (alibi's if necessary). I bring a small plastic tupperware type container or tie a cloth bag to my box to put the empty brass in. With a little organization you will be ready faster than those loading magazines for their bottom feeders. ok this may be stupid.... but what kind of rules are there for ammo in a pratice ball match? LRN, JRN, store bought, reloads???? The rules for a "practice" ball match that allows revolvers wouldn't really conform to the same rules that an official ball match would. The rules for Distinguished Revolver say you can shoot any safe .38spl 158gr LSWC or LRN ammo. 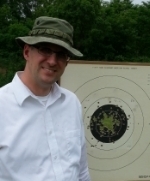 My testing shows the Remington UMC 158gr LRN ammo is the best ammo for my revolver. Rob Kovach wrote: The rules for Distinguished Revolver say you can shoot any safe .38spl 158gr LSWC or LRN ammo. The current version of Rule 3.1.4 actually states that any 158gr .38 Special round-nose or semi-wadcutter ammo is allowed -- no hollowpoints, but any bullet material is allowed: lead, jacketed, soft-point, etc. Factory loaded, remanufactured, or handloads are allowed; whatever works best in your gun. Paul- Which day are you shooting? I'll be at Castleton for the Sunday matches. Welcome aboard! All good advice here- I may try the 2700 .22 Aggregate myself. Have had ammo issues with the .45. Listen to the commands and watch others, but when it's time to shoot, only safety and your shot process matters. jwax wrote: Paul- Which day are you shooting? I'll be at Castleton for the Sunday matches. Welcome aboard! Not 100% sure yet. I was going to try sunday though. Well I decided to bail on the ball match, and do the 2700 .22 match only. I figure that would be more then enough to deal with, and worry about for my first match. Why compound the already bad first match jitters. s1120 wrote: Well I decided to bail on the ball match, and do the 2700 .22 match only. I figure that would be more then enough to deal with, and worry about for my first match. Why compound the already bad first match jitters. You could probably jump in to the practice ball-match if you decide you're not as nervous after the 2700 and want to extend the fun for a little bit; the match director would probably be OK with that. jwax, yup ill be there sunday also. few more ..... i knoe i need empty chamber flags. ive always just used a wire tie. is that exceptable ? ive also had problems finding target pasters. some are telling me to just use masting tape. whats accecptable? Should i bring a chair? cooler with water?? all new to me. s1120 wrote: jwax, yup ill be there sunday also. Empty Chamber Indicator/ECI - zip-tie would be fine as long as it's plainly visible; trimmer/weed-whacker-line is commonly used, too. I used a convenient leaf, once, when I didn't have anything else. Target pasters - masking tape is fine; I keep a roll in my gun box, and one of my goals in a match is to avoid having to use it. Also bring a staple-gun and a box or two of staples. Chair/cooler - sure. Chairs/benches might not be provided by the range, and a cooler with water and foods (nothing with a lot of refined sugar!) would be good to have. good idea with the trimmer line i have spools of the stuff!!! s1120 wrote: good idea with the trimmer line i have spools of the stuff!!! Tie one end in a knot to make it easier to manipulate, and make it long enough to extend a couple inches on both ends (muzzle and breech) through the bore of your .22; should you ever wish to try any of the International disciplines, you'll be good to go. Yeah, you don't need much stuff...gun, ammo, eyes & ears, staple gun, tape, and an ECI and you're in business. Anything more than that is just a matter of personal preference. See you there Paul! I would add a few more items- a space pen for scoring in the rain. And a small 5" X 7" clipboard for holding scorecards. Perhaps a large-enough ziplok bag to hold it all too. Scoring in the rain is no joy, but a real possibility. Keep an umbrella handy also. na... no rain.. Im sure. ok the big day is coming, and im not really ready. but are you ever for your first match? my big issue is all my shooting has been at 25 yards and less. im not worryed shooting at 50, ive shot iron sight rifles at 50, and 100, but mostly worryed about sight adjustment. Anyone shoot slide mounted irons on a high standard 104? In the 50 yard slowfire is there time, and is it allowed to scope the shots, and do a click or two on the sight?